After Digital Research made CP/M-86 available for the IBM PC, they released a number of CP/M-86 IBM PC applications. However, since everybody wanted to use DOS, Digital Research eventually made some of these available for DOS. I have added an original disk and manual set of DR Draw 1.0 and DR Graph 1.0 for DOS IBM PCs to the library. The previous DR Draw was incomplete, and the DR Graph was specifically for the TI Professional Computer. It is not perfectly clear when Digital Research first released each of the DOS and CP/M versions. These two are labeled as "1.0", are compatible with PC-DOS 1.1, and have some file dates of early 1984. I suspect they had IBM PC CP/M-86 versions available prior to the DOS versions, but I can't find much information on that. Digital Research's application offerings were also available for a number of 8-bit CP/M-80 systems. DR Draw and DR Graph (Typically pronounced Dee-Are, not "doctor") are implemented with Digital Research's GSX-86 graphics library, and support the use of Mouse Systems and Microsoft mice. GSX is a portable graphics runtime. It operates as a TSR, that applications can call. Because the GSX-86 library uses drivers, it was possible to upgrade an existing binary product just by adding a driver. Additionally, because DR Draw and DR Graph are shape-oriented, they can scale up to higher resolution displays, printers, or plotters. The IBM PC DOS version supports IBM CGA, IBM 3270 PC Graphics, Plantronics PC+ ColorPlus (emulated by PCE), Hercules Graphics Card (not compatible with clones? ), and the Artist 2 Graphics Card. Interestingly, the Plantronics PC+ ColorPlus is emulated by PCE. It is still ~200 scan line, as this card was designed to work with IBM RGB monitors, but seems to offer 4 colors at 640*200. I had some odd problems getting the Hercules driver to work. I could not get the graphics mode to initialize on DOSBox, PCE, or even on real hardware using a clone card. Yet it worked in MESS??. Why??? These drivers were not included with the versions previously on Winworld. Being such an early graphics product really brings out how horribly IBM CGA sucked. At the time in early 1984, if you had a "pure" IBM environment and needed PC graphics, IBM CGA was your only choice. The IBM Monochrome Display Adapter did not support graphics at all, but provided much more readable 80-coloum text modes. Users of the Compaq Portable were treated to high resolution text modes similar to IBM MDA, with the ability to instantly switch to 100% compatible IBM CGA graphics modes. IBM PC MDA users were able to replace their text-only MDA cards with Hercules Graphics Cards, and display high resolution monochrome graphics (720×348) on their existing IBM monochrome monitors. Meanwhile, other less or non-IBM PC hardware compatible DOS systems were pushing around 400 scan line displays. And somewhere in the distance the Xerox Star and other high-end graphics workstations were laughing their butts off. IBM EGA was released later in 1984. Wanted: DR Graph and DR Draw for other platforms! Supposedly DR Graph and DR Draw were ported to a number of other x86 DOS or CP/M-86 platforms. From what I can tell, this should include the TI Professional Computer, AT&T 6300, and NEC APC. 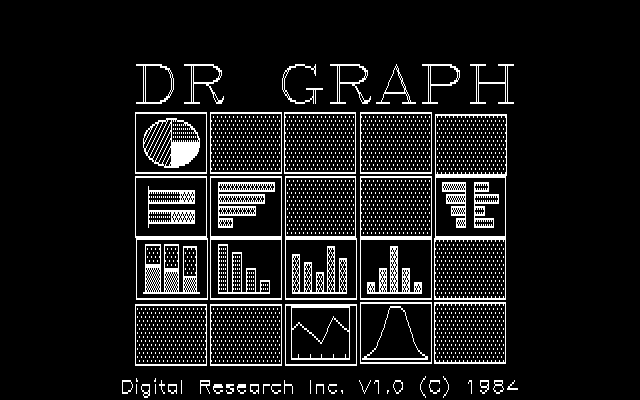 Winworld has the TI Professional Computer version of DR Graph. Digital Research also sold a hardware system called "Presentation Master" that included DR Draw and DR Graph and a 35MM slide camera. This would produce very high resolution slides using the shape based drawings. Digital Research also offered a mainframe service called "Digital Research Access10" for more complicated graphics. 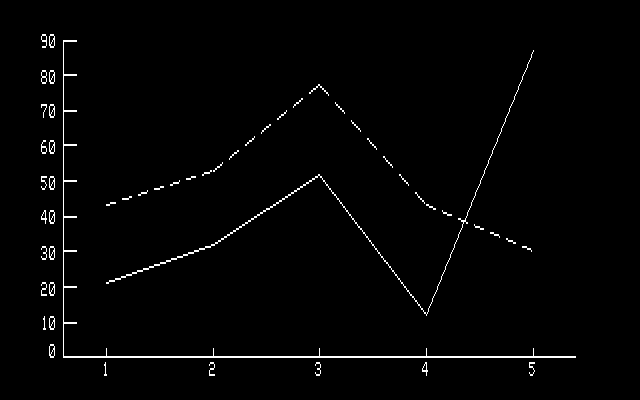 It is not quite clear how that would have involved DR Draw/Graph. Anyway, it is interesting to see such early graphics programs, especially ones that as portable as these. Finally more Software Spotlights! This is the main reason I'm happy the forums are back.